You select which audio clip (2) to play for certain scenarios (1). 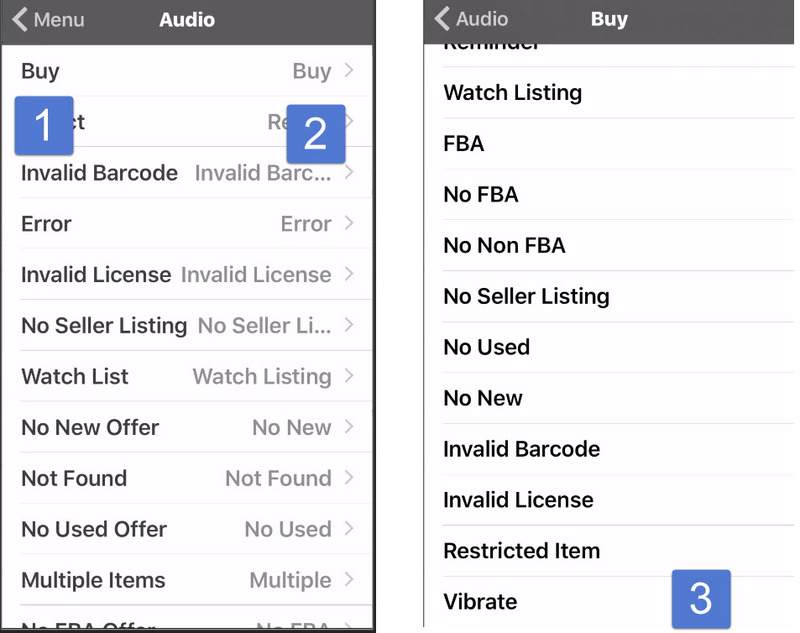 *For quieter operation, you can choose the ‘vibrate’ (3) or ‘no sound’ option from the sound list for any result listed here. Buy: An item is signaled as ‘Buy’ based on the triggers. Reject: An item is signaled as ‘Reject’ based on the triggers. Invalid Barcode: The input number is not a 10 digit ISBN, a 12 digit UPC, or a 13 digit EAN number. Error: The program has an error. Invalid License: The database’s license file does not match the smartphone’s account information. Please restart the phone and do a fresh data download to fix this issue. If the problem persists, please contact us. No Seller Listing: An item has no offers. No New Offer: When a trigger uses a new offer to compare against the minimum price, and there are no new offers. Not Found: An item is ‘Not Found’ in the database or not listed on Amazon after a live search. No Used Offer: When a trigger uses a used offer to compare against the minimum price, and there are no used offers. Multiple Items: A number has multiple listings on Amazon. No FBA Offer: When a trigger uses an FBA offer to compare against the minimum price and there are no FBA offers. FBA as Buy: When a trigger signals an FBA offer as ‘Buy’. No Non FBA Offer: ‘Ignore FBA’ is enabled in a trigger and an item only has FBA offers. Restricted Item: Item is restricted to your Amazon account.